A busy and attractive northern county town, which lies within a bow of the beautiful River Wansbeck. 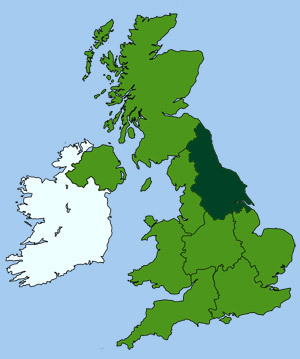 In the early 18th-c Morpeth was the last market in Northumberland, along the southern cattle route. 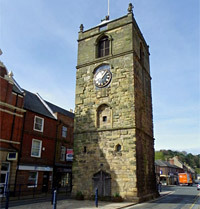 Morpeth's most famous landmark is a 15th-c clock tower, which stands just off the old market place in Oldgate. The clock's curfew bell is still rung at 8 o'clock every evening. The nearby town hall, designed by Vanbrugh, is an elegant structure dating from 1718, which now hosts the local farmers market as well as local council meetings. Further along Bridge Street, near the town bridge, is the small but fascinating Morpeth Chantry Bagpipe Museum, which also houses the town's Tourist Information Centre. The handsome town bridge, built in 1831, leads over the river to the 14th-c parish church of St Mary, set well away from the town centre on high ground. It has some of the finest stained glass in Northumberland. In the churchyard stands a small watch tower, built in 1831 to help protect against the gruesome practice of body snatching. In the cemetery is the grave of suffragette Emily Davison, who died under the hooves of the King's horse at the 1913 Epsom Derby. Behind the church is the impressive castle mound, which was constructed after the Norman Conquest. Very little is now left of this noble fortress that once guarded the river crossing. The banks of the river are pleasantly wooded and provide lovely country walks. The town park runs along part of the river and every year the Northumberland miners hold a colourful gala the park in early July. Located in the 13th-c Morpeth Chantry building. In previous times the Chantry was used as a hospital, a mineral water factory and finally a school, where the famous Tudor botanist William Turner once attended. The museum specialises in the history and development of the unique Northumbrian small bagpipe and its music. There is also a collection of other types of bagpipes from around the world, from India to Scotland.